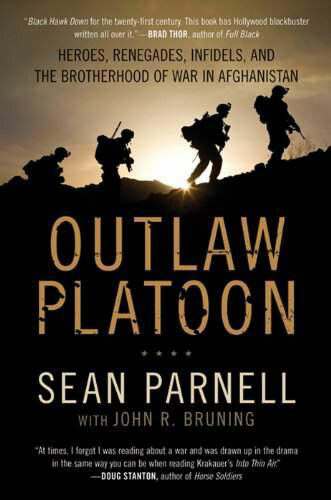 A riveting story of American fighting men, “Outlaw Platoon” is Lieutenant Sean Parnell’s stunning personal account of the legendary U.S. Army’s 10th Mountain Division’s heroic stand in the mountains of Afghanistan. Acclaimed for its vivid, poignant, and honest recreation of sixteen brutal months of nearly continuous battle in the deadly Hindu Kush, Outlaw Platoon is a Band of Brothers or We Were Soldiers Once and Young for the early 21st century–an action-packed, highly emotional true story of enormous sacrifice and bravery. A magnificent account of heroes, renegades, infidels, and brothers, it stands with Sebastian Junger’s “War” as one of the most important books to yet emerge from the heat, smoke, and fire of America’s War in Afghanistan. 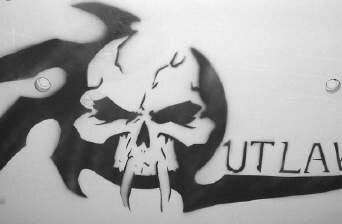 The image at right is the logo Lt. Parnell developed and painted in green on the doors of the platoons vehicles, causing the Taliban to refer to the unit as the “Green Skulls”.